March 2017 saw 10 members of Lodge of Charity No 2651 from Warrington, drive to Nottingham to attend the 30th meeting of the Lodges of Charity, at the home of Lodge of Charity No 8769, in West Bridgford. These annual meetings were started when Will George from Lodge of Charity No 1551 in Birmingham met up with Graham Aitken from Lodge of Charity No 8769 in West Bridgford in 1982 and after much correspondence and numerous telephone calls, the first annual meeting of the Charity Family of Lodges was held in 1988. Annual meetings have been held since in the homes of 11 Lodges of Charity throughout UGLE area, as well as Charity Masonic Lodge No 688 in Belfast, of the Irish Constitution. The meeting was opened at 3 pm when Brendan O’Grady, DC asked the 60 brethren present to be upstanding to receive Philip Marshall, Provincial Grand Master for Nottingham. He was warmly welcomed by Keith Hollingworth WM, who then offered the gavel to Philip which he immediately returned with grateful thanks. The DC asked the brethren to be upstanding whilst the officers of the lodge entered in procession. The brethren sang the opening ode after which the lodge was opened by the WM. The minutes of the previous meeting were approved and signed. The WM congratulated Robert Grummitt who was to be appointed as PAGDC at the next meeting of Grand Lodge. 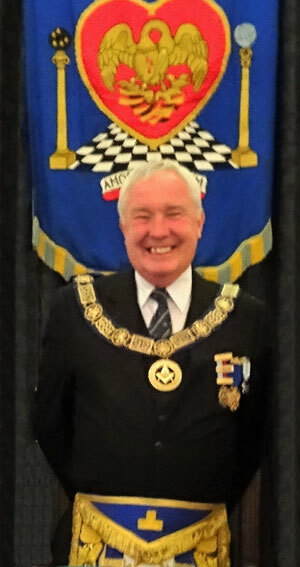 Under the direction of the DC, the brethren gave honours to the grand officers; Philip Marshall, Stuart Cummins, Colin Young, Hugh Stoddart, Graham Richie and Terry Straw and to all the Provincial grand officers present. Appropriate responses were given by Phillip, Stuart, Colin, Hugh and Martin Lawrence. There was a report and Jim Pike, IG announced that Mark Burton stood without and sought admission as an initiate into Freemasonry. The secretary, John Cooke, confirmed that all the necessary paperwork had been completed and Mark had paid the necessary dues. He was conducted around the lodge by Peter Burton his father who was acting as JD. Mark was then duly admitted and initiated into Freemasonry in accordance with antient rites. Manjinder Seehra JW gave an outstanding rendition of the initiates charge. After the first rising, Phillip gave greetings from the Province and presented the ‘Harold Mace Plate’ to the lodge in respect of the outstanding achievement by the lodge brethren in exceeding their 2018 Festival target. This was accepted on behalf of the lodge by Jeremy Daniel, an entered apprentice. Phillip, accompanied by the grand officers then retired. The WM, Keith, duly closed the lodge at 4.50 pm after the second and third risings and after the brethren had joined together in the closing ode and the National Anthem. The brethren dined on vegetable soup, roast beef and fruit crumble at the festival board which followed the meeting. Will responded to the toast to the visitors and informed everyone that the 2019 annual meeting would be held in Belfast on a date to be determined. The collection plate and the raffle realised a total of £570 which will go to the ‘Prostate Charity’ that is being supported by the Province of Nottinghamshire. The brethren departed in love and harmony at 9 pm. Story and pictures by Alan Bristow. Pictured from left to right, are: Back row: John Pether, Chris Betts, Quinten Newhall, Phillip Marshall, Tom Owen, David Spear and Mal Myers. Front row: William Bell, Vic Charlesworth Jeff Brookes and Alan Bristow.